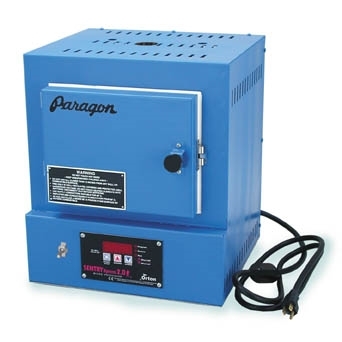 Paragon's SC-2 has a high-tech ceramic fiber firing chamber, which is wrapped in a steel inner case. The outer case remains cool due to the layer of air between it and the inner case. The case is slotted for air circulation. The electrical components, located in the base - stay cool even at extended hold times. The SC-2 is great in classrooms because the elements are embedded in ceramic fiber. The SC-2 has two separate heating elements in the left and right sides of the firing chamber. The back of the chamber has no element. Testing shows that the heat distribution in the SC-2 is more even throughout the firing chamber, because heat does not build up in the back of the kiln. Large, yet portable. The SC-2 can hold three shelves of silver clay, yet is portable enough to take with you to classes. Program the firing schedule that is perfect for your projects - you are not stuck with preset programs. The programmer turns itself off after the firing is completed. The SC-2 is easy to program - it fires automatically at the rate and temperature you enter. A brightly lit display prompts for firing rate, temperature and hold time. The fast firing element is embedded in the firing chamber shell. Each SC-2 includes a 1/4" thick ceramic fiber shelf. The reliable Sentry Xpress 3-Key controller is packed with features. It includes tow modes: single speed, and 8-segment ramp hold. Program the Temperature Alarm to sound when the kiln reaches a specific temperature - use this to remind yourself to check on the kiln. Paragon's warranty is not affected by frequency of use. Fire your new kiln every day if you want, even in commercial settings.